NASA's commercial crew cadre includes Bob Behnken (top left), Eric Boe (top right), Doug Hurley and Sunita Williams. HOUSTON — NASA has named its first commercial crew "cadre" — four astronauts who will train to fly on board the first test flights of Boeing's CST-100 and SpaceX's Dragon spacecraft. 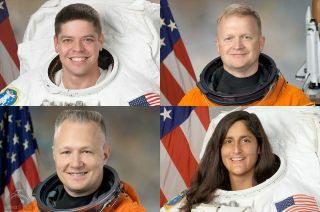 The agency Thursday (July 9) announced that astronauts Bob Behnken, Eric Boe, Doug Hurley and Sunita ("Suni") Williams will train to fly on the commercial capsules' maiden missions to the International Space Station. The test flights are slated to launch in 2017, though they could face delays of a year or more depending on congressional funding levels. In September 2014, NASA selected Boeing and SpaceX as its commercial partners to taxi astronauts to and from the space station, to relieve the United States' reliance on Russia's Soyuz and regain some of the capability lost with the retirement of the space shuttle. The announcement on Thursday came four years to the week after the last space shuttle mission launched in July 2011. Both Boeing's CST-100 and SpaceX's Dragon spacecraft will fly four crew members to the space station when they begin operational flights. For the test flights however, each will fly with just a two-person crew. Boeing will launch with a NASA astronaut and its own crew member, who will be identified later this summer. SpaceX is planning to fly two NASA astronauts. Behnken, Boe and Hurley were members of NASA's 18th group of astronauts selected in July 2000. Williams joined the corps one class earlier in June 1998. Boe also flew twice, once on board Endeavour in 2008 to restock the station (STS-126) and then on the last mission of the shuttle Discovery (STS-133) in 2011. For the past two years, he has served as deputy chief of the astronaut office under Behnken. Hurley helped to deliver Japan's Kibo exposed platform on Endeavour in 2009 (STS-127) and then piloted Atlantis on the final flight of shuttle program (STS-135) in 2011. Since September 2014, Hurley has been appointed the assistant director for the commercial crew program under the Flight Operations Directorate (FOD) at Johnson Space Center. Unlike Behnken, Boe and Hurley, who spent less than 30 days in space over the course of their two flights, Williams has already logged nearly a year off the planet during two long duration stays aboard the station. In June 2007, she launched on Discovery to join the Expedition 14/15 crew for 195 days. She returned to the station five years later on a Russian Soyuz, and during that 127-day flight served as Expedition 33 commander. Until last month, Williams was the world record holder for the most time in space by a woman (she still retains that record for an American female). She also holds the current record for the most time spacewalking by a woman at 50 hours and 40 minutes over the course of seven outings. Boeing's CST-100 (left) and SpaceX's Dragon space capsules are designed to fly astronauts the space station. Boeing's CST-100 and SpaceX's Dragon are both reusable capsules designed to carry crew and limited cargo to and from the space station, as well as serve as an emergency lifeboat by remaining docked to the outpost for up to 180 days. The company has started construction of its crew access tower at the Cape Canaveral Air Force Station's Complex 41 and remodeled a shuttle-era hangar at Kennedy Space Center in Florida to serve as the manufacturing facility for its CST-100 capsules. Boeing expects to fly an uncrewed test flight to the station in early 2017, followed by a pad abort test. The company's first crewed flight would then come later that year. SpaceX's Crew Dragon, which is an upgraded version of the capsule the company uses to fly cargo to the station under a separate NASA contract, flies atop SpaceX's own Falcon 9 rocket and will return to Earth under parachutes to an ocean splashdown. (SpaceX plans to eventually use thrusters to land Dragon on solid ground). SpaceX flew a successful Dragon pad abort test in May and anticipates conducting an uncrewed orbital test flight in late 2016, followed by inflight abort test. The company's first crewed flight test would then be sometime in 2017. "Our plans to return launches to American soil make fiscal sense," stated Bolden in a message sent to the agency's workforce on Thursday. "It currently costs $76 million per astronaut to fly on a Russian spacecraft. On an American-owned spacecraft, the average cost will be $58 million per astronaut." "What's more, each mission will carry four crew members instead of three, along with 100 kilograms [220 pounds] of materials to support the science and research we conduct on the International Space Station," he said. The commercial crew program marks a departure from the way NASA has historically contracted for and crewed its spacecraft. Boeing and SpaceX will own and operate their own fleet of vehicles and be able to sell human spaceflight services to other customers.